Welcome to the weekly newsletter from The Edge Group. The goal of each edition is to help you think differently about B2B content. If you like this email and know others who might as well, have them sign up here. We hope that we’re not tiring you out from our repeated mentions of how email will translate to voice assistants, but we think it will be really, really big. It’s an incredibly natural extension for the already conversational nature of a newsletter. We still use Mailchimp as our primary platform (it’s how this newsletter is delivered), and while we may have some worries about the company’s recent strategic shift, it’s still an incredible product. One of the things that made us, along with legions of other email folks, fall in love, are the tiny product animations that wholly capture the emotions a user faces while delivering a campaign. The InVision blog found the designers responsible for the memorable animations to tell us the story of how it came to be. Editor’s note: for anyone who has hit send on a campaign to hundreds of thousands of recipients, the sweaty hand animation could be the single most empathetic UX detail we’ve ever encountered. We love nothing more than 3,000+ words of ruminating on the medium and form of newsletters. 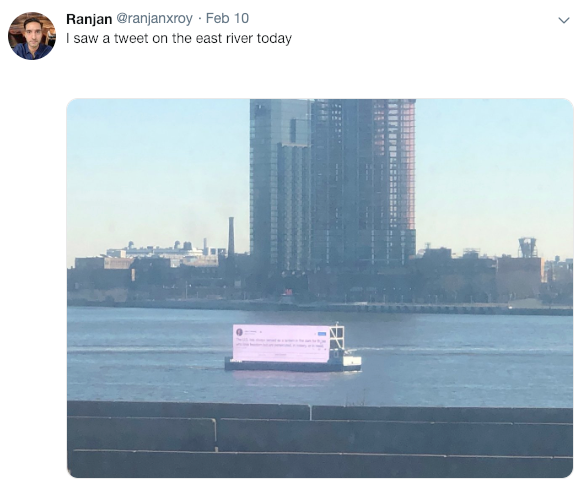 There was a tweet floating on the East River in New York City last week. The company reponsible is Ballyhoo Media, and we’ll the folks at Digiday tell you all about them (pitch deck included). The idea of earnings calls and even webinars moving to LinkedIn is a very logical one, but, like many of recent product efforts from our favorite big tech firm, we’ll believe the value when we see it. Mike Isaac, tech columnist at the NY Times, just launched a personal newsletter effort on the Substack platform. It’s….an interesting one. Of even more interest to us is how different his writing and communication style comes through when crafting an email. 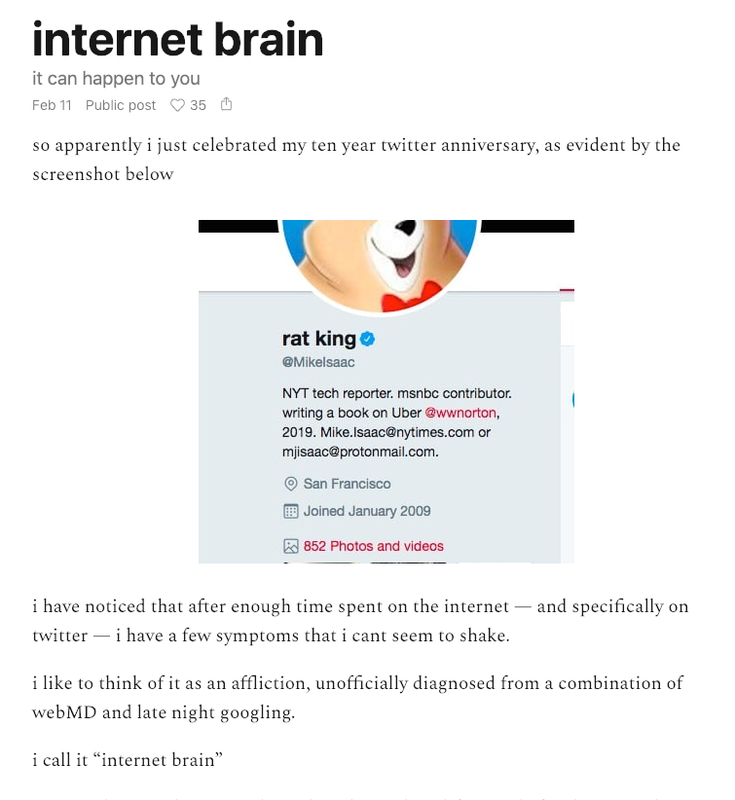 He’s one of our favorite tech writers and we’re excited (and perhaps a little bit scared) at where he takes this. Readers of this newsletter seem to keep clicking on videos, so we’ll now end each edition with one. 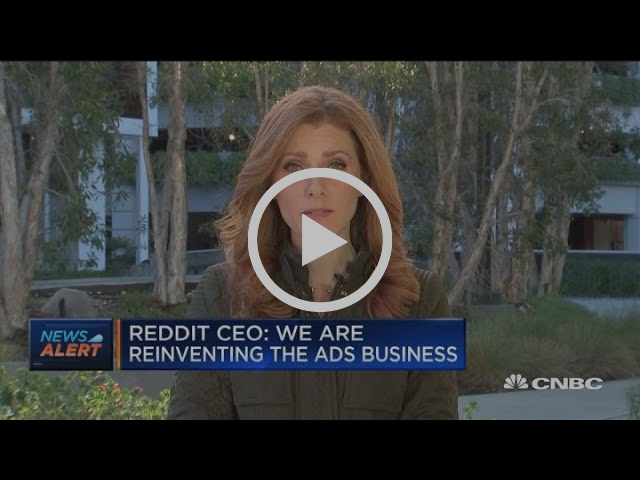 As fans of the platform Reddit, we were shocked when they announced they a $300 million fundraise, and are still processing what this means for the digital media ecosystem (though this scale of value was perhaps telegraphed when they hired former Time Inc COO Jen Wong). And in a video depicting the deep commitment aspirational influencers dedicate to the burgeoning influencer economy (and found on Reddit), we conclude this edition with “This Instagram boyfriend is committed”.